The latest YouTube meme Nyan Cat finally comes to life as cuddly plush toy made from Gund! This cute little animated cartoon pop-tart looking cat has been viewed on YouTube by millions flying through space with a rainbow trail chasing behind him. 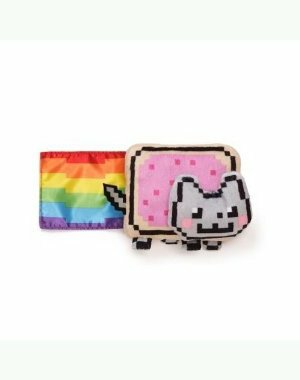 Nyan Cat from Gund is made with soft, high quality, vibrant colored materials! Now you can have your very own Nyan Cat to cuddle with every night. All orders will start to be shipped the first week of November.